I also wrote a short story for SHOCK called MOMENTS. Illustrated by Will Sliney, colored by Sjan Weijers, and lettered by Marshall Dillon. MOMENTS description: Imagine logging into a social network that has all of the events of the next 24 hours.Will you be able to change the future? Or will the future change you? 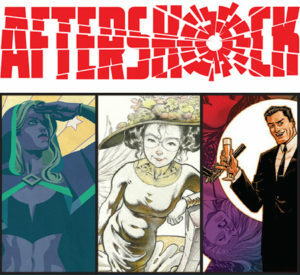 SHOCK description: AfterShock Comics continues to push boundaries by presenting its very first anthology collection featuring a slew of today’s top writers and artists. Presented in the European Album format, this handsome hardcover features the creative talents of Brian Azzarello, Marguerite Bennett, Cullen Bunn, Mike Carey, Andy Clarke, Sarah Delane, Aaron Douglas, Joe Eisma, Toni Fejzula, Francesco Francavilla, Neil Gaiman, Michael Gaydos, Marc Guggenheim, Phil Hester, Paul Jenkins, Szymon Kudranski, Laci, Leila Leiz, Travis Moore, Joe Pruett, Cliff Richards, Andrew Robinson, Hoyt Silva, Will Sliney, Jim Starlin, Richard Starkings, Brian Stelfreeze, Dalibor Taajic, Frank Tieri, Charles Vess, Bill Willingham, Mike Zagari, Michael Zulli and more! Cover art by John Cassaday with Laura Martin!